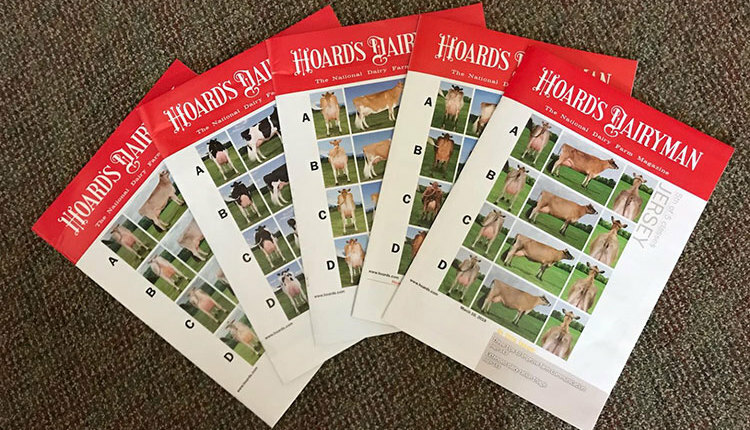 C A B D is my placing for this class of Brown Swiss cows. The class sorted itself into two pairs. The stylish C places over the dark A for her advantage in style, balance, frame, and capacity. C is more powerful through the front end, being deeper in the heart and wider on the chest floor. Additionally, C stands straighter on her front legs, noting that A toes-out on her front legs. C also blends more smoothly from neck to shoulder and shoulder to barrel and has more depth, sweep, spring, and openness to both her fore and rear rib. Still further, C carries her udder higher above the hocks. I grant that A is wider in the rear udder attachment. Next, in a more logical placing, A places over light-colored B. A carries a more youthful udder higher above the hocks and she is higher and wider in the rear udder attachment. 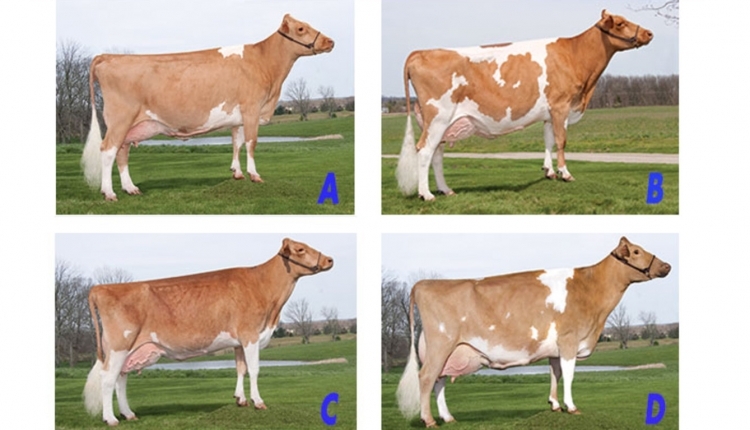 In addition, A has more clearly defined halving through the rear quarters and keeps shorter teats placed more squarely on the floor of the udder, noting the long teats and wide teat placement of B. Additionally, A is much flatter and cleaner through the hocks. I admit that B has more total frame and capacity, with more depth of both the fore and rear rib. Finally, B places over D for her advantage in the udder. B has a longer fore udder and is tighter in the fore udder attachment. 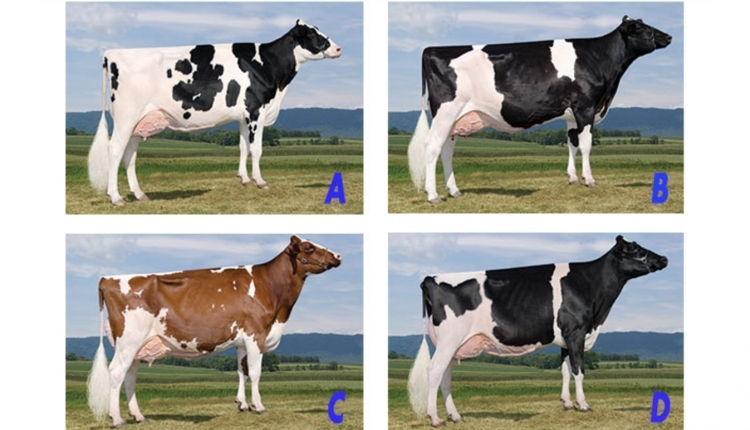 Also, B is fuller at the top of the rear udder and is more nearly level on the udder floor. Furthermore, B is deeper in the chest and blends more smoothly through the front end. Although D has shorter teats, placed more centrally on each quarter, I feel justified in leaving her last because she lacks the youthfulness of udder. 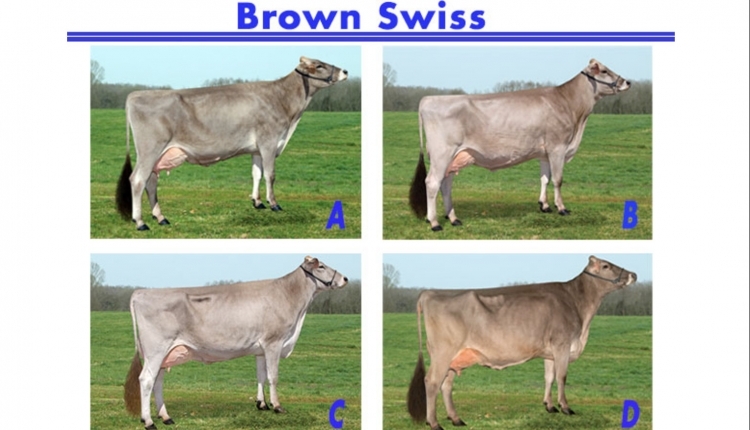 Winkelman placed the BROWN SWISS. She hails from a 130-cow registered Brown Swiss and Holstein farm in Watertown, Wis. Winkelman earned her Ph.D. at Cornell University and now serves as a dairy nutritionist and technical specialist for Vita Plus. As an undergraduate, she was a member of five winning dairy judging teams at the University of Wisconsin-Madison. Additionally, she was high individual at the 2002 Intercollegiate Contest and the 2000 National 4-H Dairy Judging Contest. Winkelman has judged county, district, state, and national shows in Wisconsin, Indiana, Ohio, Minnesota, Pennsylvania, and New York. Click here to see more classes in the 2012 Cow Judging Contest.